Good morning! 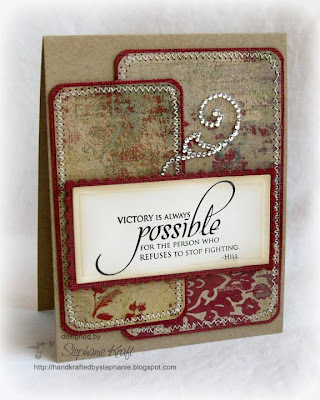 I have another sentiment card to show you today. I used Card Positioning Systems sketch, CPS136. The quote comes from Verve's amazing set, Believe. Julee is donating a generous $10 for each set sold to Susan G Komen for the Cure. Accessories: Long Rectangle and Scalloped Long Rectangle Nestabilities (Spellbinders), Corner rounder (Marvy), Rhinestone swiril (MAMBI), Foam tape, Thread, Sewing machine. stephanie...SHUT UP!!! this is spectacular! great color combo, papers, and rhinestone flourish! gorgeous job! This is so pretty! I love the sentiment. This is beautiful! I love the paper and layers and that jewel flourish. The dp is gorgeous is actually looks like a plush fabric. Ohhhhh, I'm so obsessed with this Life Stories DP right now. This looks AWESOME...especially with the bling!! Just beautiful! Love the stitching and the bling!